What a tragic story! It makes me so very thankful for what I do have. oh man, the story is somewhat depressing, but I guess you nailed the essence of thanksgiving. we should really be thankful for everything because other people somewhere out there are not as lucky or as fortunate as we are. I believe pain and suffering is always meant to educate our minds to create awareness which hopefully, will lead to mindfulness on living a meaningful life, a life of loving kindness to all in need. All the ups and downs I encountered in life, I'm glad I have my family, happy and healthy. Your brother's friend lost her dad at such a young age and now she takes care of her mom show what a wonderful lady she is. This thought just came to me. 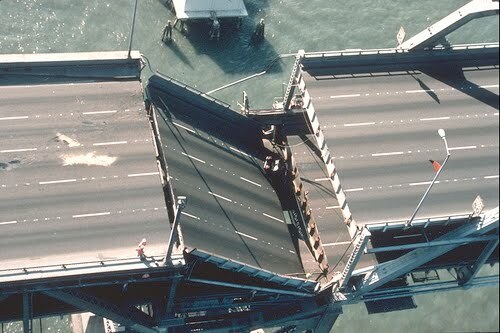 If I remember correctly, one of the two cars that were stuck in between the collapsed span was a man from Oakland. I don't think it was one fatality on the bridge, it was much more. I'm very scared to read these kind of disastrous news. I pray for no fatality occurred whenever I read that. I do remember this earthquake. Very scary and I also remember the freeway and bridge damages. My prayers to the lady who lost her father. @Cheryl - Makes me grateful for what I have too! @Ryhen - Yup, whenever I hear about the misfortunes of others, makes me appreciate ever so more the things that I do have. @Gratitude - Thanks for the enlightened comment. @KN- Yeah, I think every San Franciscans remember this horrible day quite well. @Dora - These kinds of news are depressing but again, I think bad things make it is realize and appreciate how precious life is. @Jane - The freeway and Bay Bridge collapses are what people remember most because of the constant news converage after the earthquake. Such a sad story. Like you, I feel there are so much to be thankful for. I feel so blessed that my family is complete. @Liz - when tragedy occurs, it makes people remember the non-monetary things in life like having ahappy and healthy family relationship and a complete family. You have to feel for the wife of the man who died on the bridge. What a horrible, arbitrary thing to happen to a family. And three children.... It breaks your heart. That is scary. 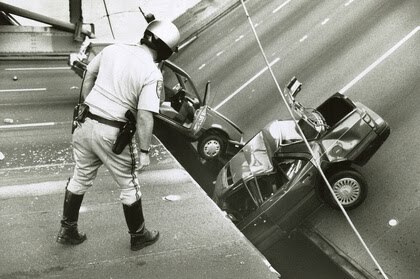 I'm glad I've never been in an earthquake. @Anthony - I think knowing that the kids also lost their mom emotionally was heart breaking. They grew up on their own. @Cascia - You are lucky to live in a non-earthquake zone region. Oh,how tragic and a sad story.